In this article, we have summarized for you the current legal situation for the use of drones in India. In India, drones were completely banned for a long time. Meanwhile, a law was passed, which is valid from 01.12.2018 and repeals the general ban. For drone pilots now very complex rules apply. However, tourists do not benefit from the relaxation of the rules, because foreigners are not allowed to fly drones in India in the future either. The import of drones is only allowed with prior permission from the Ministry of Communications (Wireless Planning and Coordination Department). If a drone is detected without authorization at the airport, it will be confiscated and not returned. I have read reports from the airports in Delhi, Ahmedabad, Mumbai, and Bangalore in particular. But at other airports, you should expect a seizure. Most privately used multicopters – such as the DJI Mavic Pro – fall into the category of micro-drones. 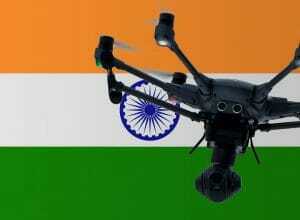 We have researched the listed drone regulations for India to the best of our knowledge. We can not guarantee the correctness of the information. If you want to be on the safe side, please contact the Indian aviation authority. Alternatively, you can also ask the embassy in your country for further information about the regulations. Please leave us a comment when you receive news and/or gain experience with your copter in India! What did you do with your drone when you entered India? Did the airport authority allowed you to take it with you or they charged you or they took your drone? Found this. Thought it may be useful to some. I love India and have been many times – for a total of over 425 days! yes about 1.3 years!!! With the Directorate General of Central Aviation announcing India’s policy on the use of drones, here’s a closer look at the finer details. 6. the Equipment Type Approval shall be granted only to an Indian agency and not in the name of any foreign manufacturer. Hence it also essential to submit a certificate of authorization from the manufacturer, authorizing the Indian agency/countrer part to act on their behalf. issued by DGCA, DGFT shall issue license for import of RPAS. c) Upon receipt of import license, the applicant shall apply to DGCA for UIN/UOAP, as applicable.